to remove the radio (non-idrive), follow these instructions. 1. take an old creditcard (or something similar) and bend one (short) side of it in a 90 degrees angle. 2. insert the card between the radio and the a/c-controls, bend side first. 3. move the card to the upper/side of the a/c-controls and pull it, making sure its bend side hooks behind the controls. 4. the a/c control unit should move forward a bit. Repeat step 3 for both left and right side. 5. you should now be able to pull the a/c controls forward. 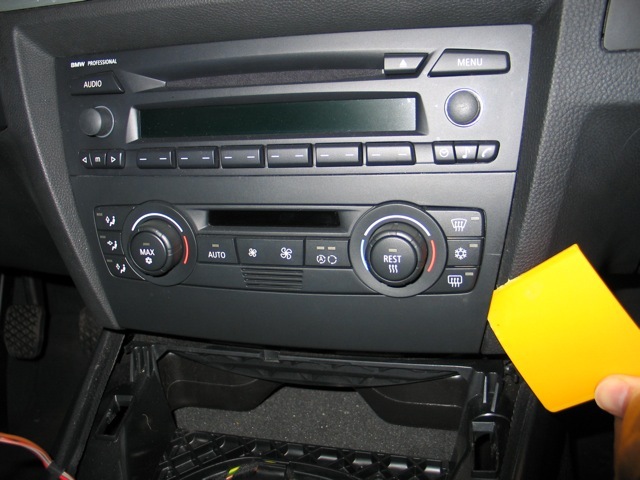 use a screwdriver to remove the two screws beneath the radio and pull the radio forward. What will you do with that hole in your Dash, 12Esc? Excellent writeup and very helpfull pictures for a question that is asked very often. I wish I´d had the info in July when I first tried to take my radio out. Would have saved me a LOT of sweat. No, not THAT kind of tierfreund! I put back the radio in the hole. I needed to open it to mount a parrot bluetooth carkit. I'll post a picture. Can you elobrate how the "parrot" integrates into the audio system? I saw the the pictures from you ,how to take out the radio from my car E90 it is very helpfull thanks for it but like i can see you mounted a bluetooth carkit in it ,thats exactly what i want to do so i'm wondering is there a mute on the radio? and where can i find the ingnition power ( +15 )?. Do you guys know what the consequences are when you leave to radio unplugged? Original genuine to reset, to the specification of audio also it is possible. It is linked to [ribasugia], alarm (the chime) sounds..."
thanks for sharing the diy with pics. But I am still lost on your description on how to use a credit card to get the control unit out. Do you have the credit card and could you snap a few picks of your credit card to give me a better pictures on how you use it? Thanks. I've tried to do it according to this intstruction, and it doesn,t work (I've got auto A/C). 1. Take an old credit card and make a gap between radio and A/C. You must see the metal hooks on the side. 2. Take a small screwdriver and press the metal through the gap. I've unplugged my radio and I've lost only the time and radio stations. Has anyone done this on a car with iDrive???.. Gazza - Check out the DIY for "TVandNAV2go"
Why is you DIY list post closed? Wow! That's a beautiful car. Do you sell it? can someone help, how can i remove the headunit on a e92. ive been trying for hours. very helpful diy..tnx…i needed it..hope I can find a diy for installing a new kool vue mirror in this forum because ive lost the manual for my newly bought mirrors..
Last edited by kurtdaniel; 11-03-2009 at 08:46 PM. I would like to see some pics of the parrot install as well.. I never think to remove the radio but the guide is good to use.I think to remove heater and AC controls,one should be cautious. I need some help with this... Tried a bent credit card mentioned above, tried plastic prying card, tried a custom-bent metal bracket. None have even budged the A/C unit. Tried prising out across the top, tried getting a grip from the sides near where the clips are shown in the photos above. Only thing that seems to want to come out is the plastic face panel (it seems to be permanently detached at a couple places now). What is the technique for getting this (enter a year's worth of swear words here) thing out of the dashboard? I'm working under the assumption that the clips and the slot they're in is at an angle slightly downward, and that the panel should tip out from the top first. 2006 330i SGM/black, ZSP, ZPP, 217, HuberOps, M Splits, K Lines, AS 3 on EC-7. Since Sep'08. This is how I did. You will find on top of the AC contorl two gaps if you slitghtly push the plastic cover outwards. Insert a screwdriver inside them and press down an pull out at the same time each at a time. It should come out with a bit of force.